Another delightful meal at the McGary household diner. The weather here has been remarkable for the most part. Temperatures have been in the high 60s to low 70s with sunny skies. Although it’s the beginning of February and dead of winter, its seems more like Spring and I’ve got the tropical island itch again. Inasmuch as it looks like we’re going to miss our annual tropical island trek, at least for a few months, I decided a nice tropical meal was in order. I also remembered this dish I had seen on Pinterest and pinned as wanting to try, at least as far as rolling the salmon was concerned. In the end, we were pleasantly pleased with the dish. I would fix this again and for anyone. It really is a beautiful plate and the flavors melded beautifully. You simply cannot go wrong with this dish. As a warning, however, you MUST roll the salmon and let it chill, preferably overnight. So this dish will require 2 days of your time. The second day is very simple and practically takes no time. The prep on the first day, however, takes about 45 minutes. This would be a nice meal to start on a Sunday evening and eat on a Monday evening when you don’t want to cook. I promise you will love this dish! 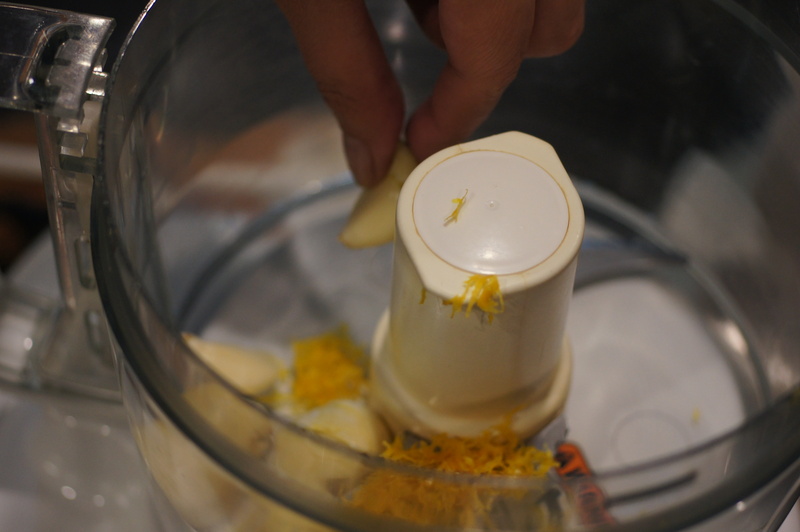 Add zest and garlic to food processor and pulse to mince. Add the cilantro, walnuts, cheese, salt, pepper, lemon juice and oil to the food processor and process to a thick, creamy consistency. This will produce roughly 1-1/2 cups of pesto, which is a lot more pesto than you will need for the dish. It stores well in the refrigerator and even freezes well. 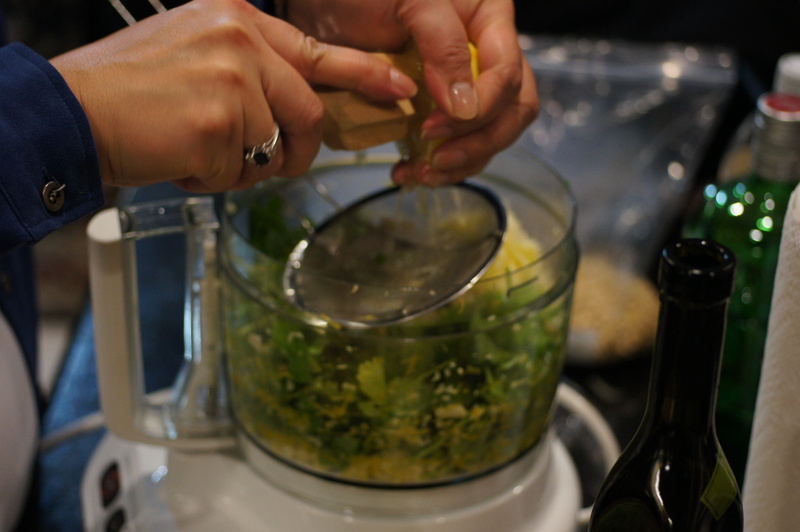 We always keep pesto on hand for quick weeknight pasta meals or to use on fish dishes, as well as some meats. Butterfly the salmon at the point beyond the belly where it begins to get thick. For this application you want to use King Salmon because of its thickness. 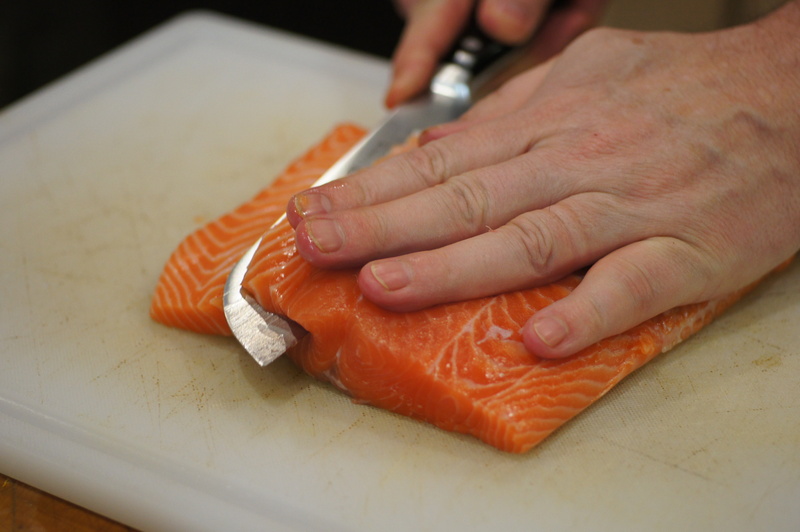 You also want to use the center cut of the salmon between the gills and tail. Cut within an inch of the opposite side. Fold open the salmon. 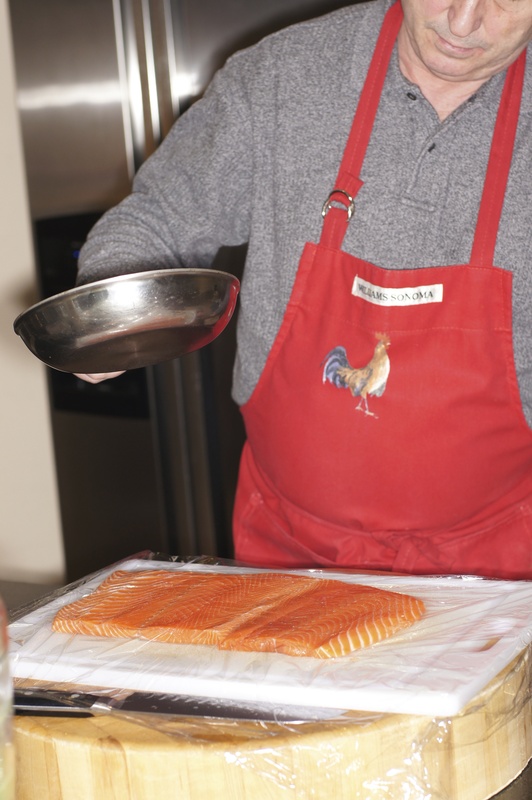 If needed, cover the salmon with plastic wrap and pound evenly but firmly with a skillet, all over the surface to a thickness of about 1/4 inch. 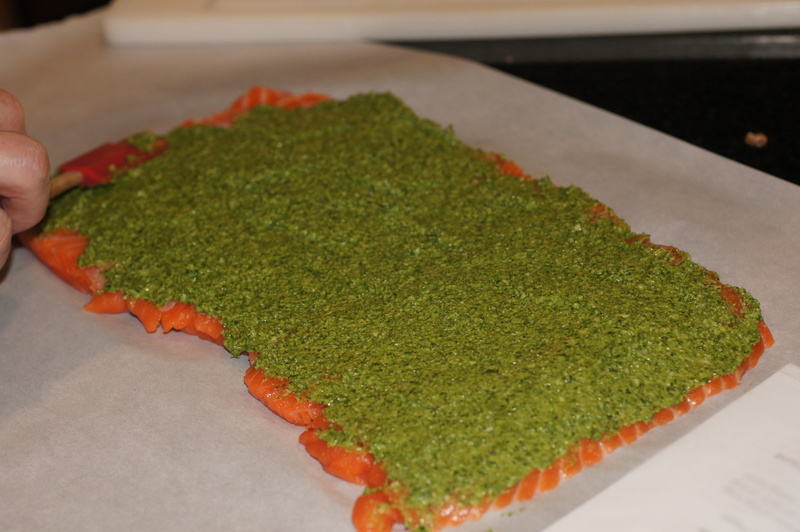 Place salmon on parchment paper and spread with pesto. 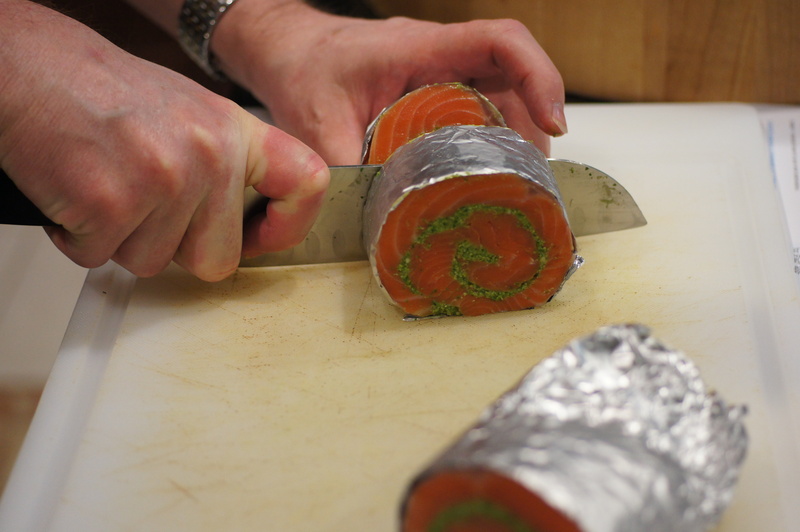 Wrap salmon roll in foil. Chill for at least 1 hour or up to 24 hours to firm the roll. Remove from refrigerator. Leaving the foil on the salmon, cut salmon into 2 inch long pieces. 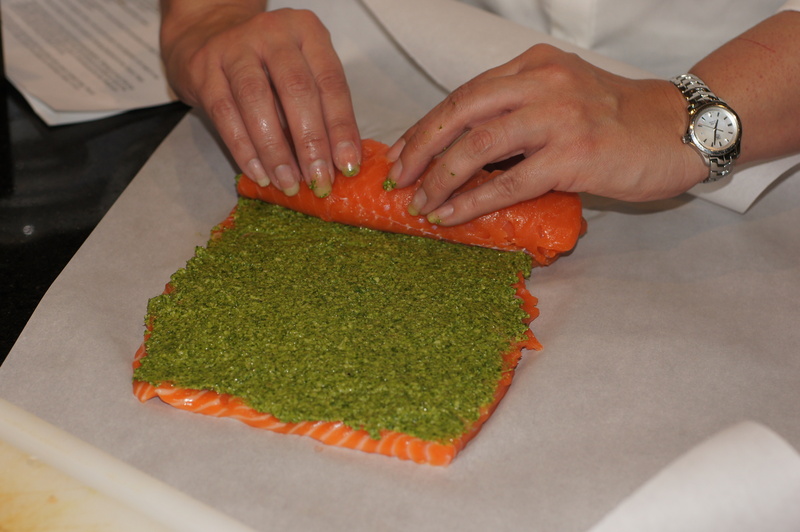 Place salmon rounds standing up onto a sheet pan lined with parchment paper with the foil still on. 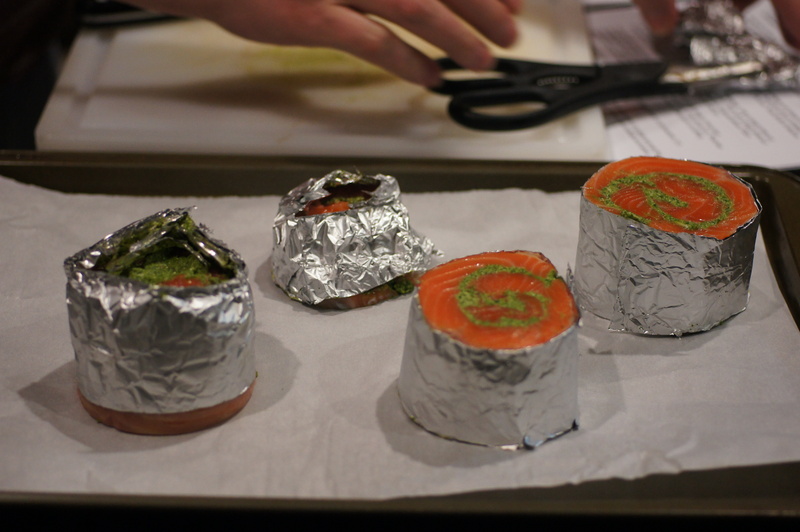 With the foil still on, place the salmon rounds in a preheated 500 F oven. Bake for approximately 8 – 12 minutes depending on how well done you like your salmon. 8 minutes produced a lovely medium salmon. 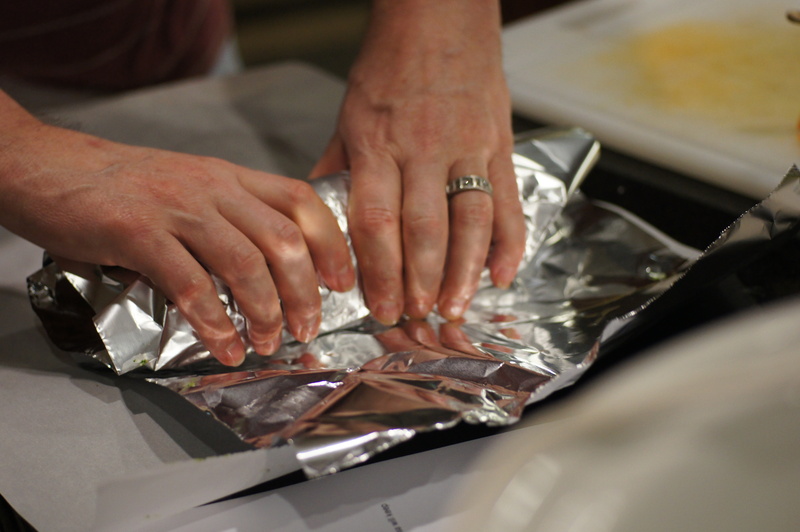 Remove from oven and remove foil. Place salmon roll onto a serving plate, in the middle. 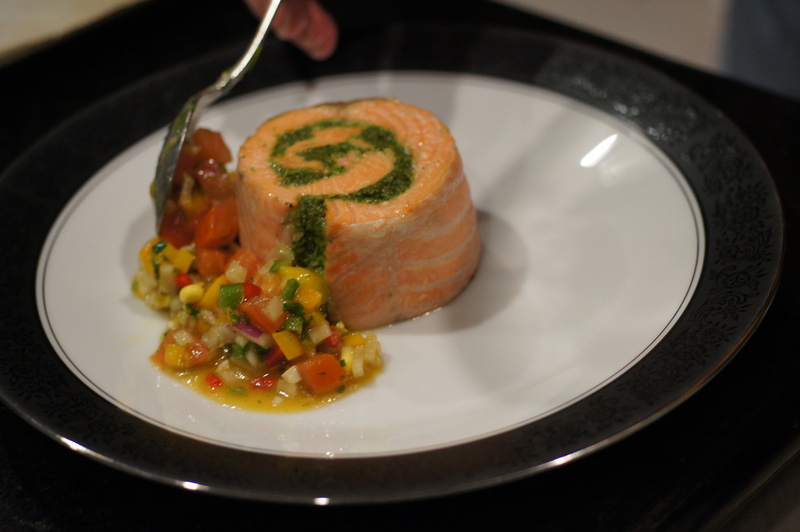 Spoon salsa around the salmon. It looks great, but there is no way I could eat anything with 2.5 cups cilantro in it! Hi, Stefan. The pesto recipe makes way more pesto than needed for the salmon. I corrected the post to explain that you will have roughly 1-1/2 cup pesto from the recipe. You will use maybe 1/2 to 2/3 cup of pesto on the salmon. 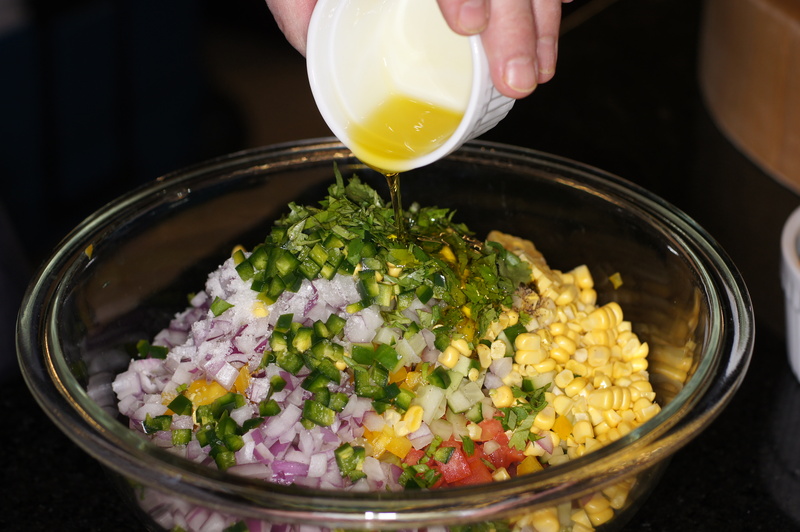 Nonetheless, each serving will probably have 1/4 to 1/3 cup of cilantro from the pesto and the salsa. Also, you are not alone in your feeling on cilantro. Julia Child hated cilantro and once said “I would pick it out if I saw it and throw it on the floor.” I actually love cilantro but…You can substitute basil for the cilantro and it would probably be very tasty, as well. I just googled the Julia Child story and found an article by Harold McGee explaining that cilantro could actually be less offensive in pesto because crushing the leaves lessens the ‘soapy’ aroma (http://www.nytimes.com/2010/04/14/dining/14curious.html). But you are right that it would probably be very tasty with basil and that will look just as pretty. I really like the presentation of the dish! WOWWWW – What a piece of beauty! I can imagine this takes 2 days to cook, look at all those details and vibrant colors. Gulp! Definitely a must try. My taste buds are so jealous of yours!! 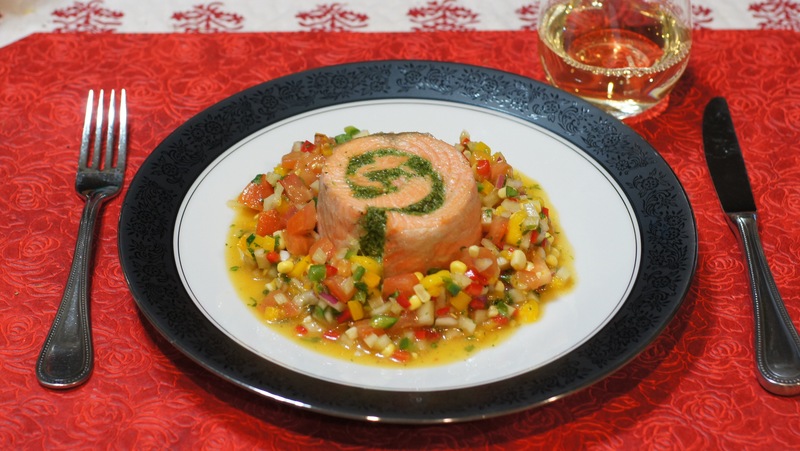 I think I would enjoy this dish a lot: I love making grilled salmon with mango salsa in the summer and I am obsessed with everything cilantro 🙂 I will try to add corn and fennel to mine next time. it sounds so good! Hi, Andreea. Thanks for your very nice compliment. I hope you give this a try. We thought it was killer, both in looks and in taste. What a gorgeous presentation. Restaurant worthy! Hi, Sheryl. Thanks for dropping by an your nice compliment. I was by your blog yesterday and noticed your Apple Streusel Coffee Cake. It’s absolutely one of my favorite coffee cakes and yours looked divine. This is another great recipe, Richard. I’m not one for cilantro but that can be easily swapped. The technique you used is something I’m definitely going to borrow. It enabled you to create that dish and fantastic presentation. This is “company food” of the best kind. Thanks, Richard. Thanks, John. Until I saw Vicki Bensinger’s post it never occurred to me to butterfly salmon and roll it. Once I saw it, the technique made perfect sense. I love the contrast of the green pesto against the pink salmon. Also, we eat a fair amount of salmon and it goes beautifully with pesto. We will definitely do this again. Love cilantro! Love this recipe! Thanks! Thanks, Mimi, for such a nice compliment. We hope you give this a try! Will definitely try this, I am a true salmon-lover. Thanks, Scribbler. We think you will like this. Lovely presentation on this one! Richard…what a beautifully prepared dish. I like everything about it. Thanks, Karen, for such a sweet compliment. We’re glad you liked it. Oh my goodness Richard!! Wow, this is so beautiful! 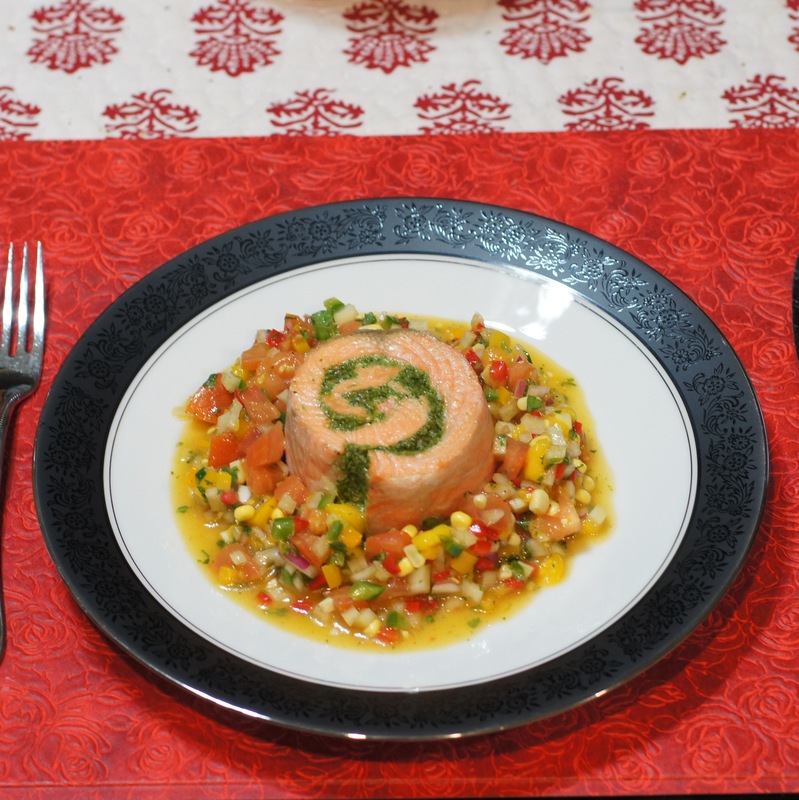 Thank you for the step by step photos for the salmon . . Wow, the salmon with the pesto + the mango corn salsa. . it all looks so wonderful! I can’t wait to try this one. . I’m definitely going to give this one a try! Love this! And what’s up with the comments re: cilantro? 😛 I love it too and actually LOVE the smell of cilantro! I make a similar dish with chicken as a roulade with a chicken forcemeat, ham slices and spinach (or chard) leaves in the roll. Rather than baking, though, it’s poached in the foil for about 15 mins and sliced on an angle after de-foiling. Maybe the salmon dish would come out OK like this? BTW I agree with some of the correspondents that a little cilantro goes a long way. How about dill in the pesto or the salsa? I just happen to see this photo linked to my name and thought I’d check it out. Thank you for linking to me. Your version sounds delicious and looks beautiful. Thanks for the nice compliment Vicki and the inspiration for the dish. 🙂 You have to give credit where credit is due and I would never have created this dish without seeing your blog.